Forty Toes: Ritchie Rags and other things! Ritchie Rags and other things! I have been blessed to photograph Ritchie Rags fall pieces. This set is just sooo soft in gorgeous flannel. Stella Marie was a trooper because we finally are getting some hot weather for a change. I also got to photograph hair clips for Lillianna Marie Designs. She sent me a huge bag full so you will be seeing lots of pretty hair clips over the next couple weeks. 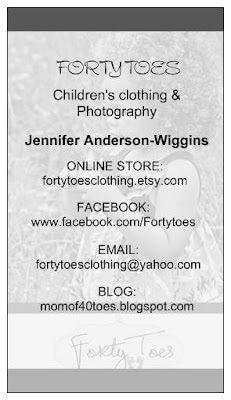 I am having a FB giveaway right now on Forty Toes Photography fan page. The first person to refer 20 people wins the Pretty in Yellow top/dress size 3/4. 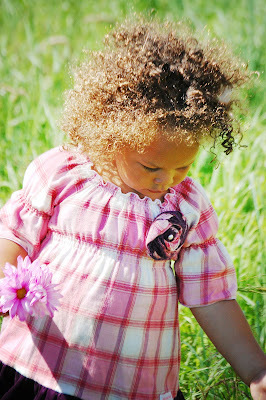 The other thing is that a good friend had her baby girls pics stolen off her blog/FB page and put on a horrible site. She has closed her blog and fan page. I am just sooo sad for her. I can not believe sick people really do this. I have been having so much fun doing all the modeling stuff with Stella Marie but this has really made me think. On a better note. I had to redo my business cards because the information is not able to be read soooo I had two wonderful people help me out. 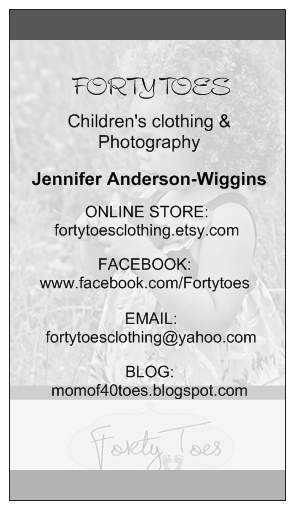 Julie from Zozobugbaby created a business cards for me here. Carrie from Main Street Bowtique created this one for me too. I know this one is hard to read but it is awesome trust me. The point is that as much as there are bad people in this world there are also lots of very kind people too. Thanks Carrie and Julie for just being sooooooo good to me! Just wanted to stop over and say hi! My cousin's are the lovely girls over at Dear Lillie. 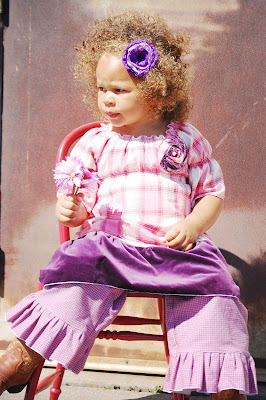 I am always hearing Good things and love your clothes they are just so adorable! Great blog as well! Thanks for showing off Lillianna Marie Designs! 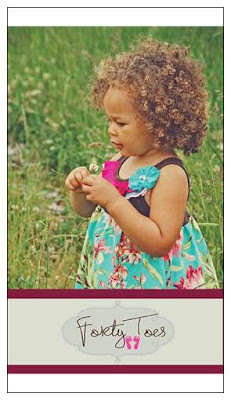 We are so proud to have SM as our newest little model! My friend designs mine for Rosie J. Photography and I love them! Always good to have friends who can help us out! Stella Maria looks beautiful in her pics as always! OMG so sorry for your friend Jenn. I am so afraid after some of my pictures of my son received comments on FB- now everything is super private. There are some really sick people in the world unfortunately. 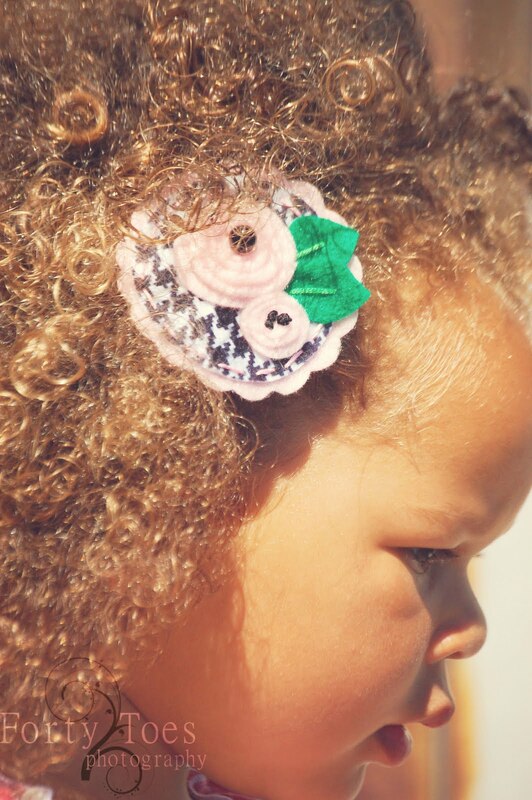 LOVE Nicole and her beautiful hair accessories. 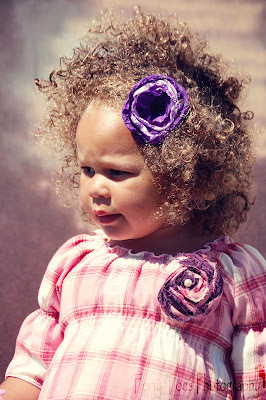 Cannot wait to see more of Stella in them!! That is terrible about your friend! I wonder if there is a way to prevent that??? On another note, isn't Nicole awesome!!! We LOVE her hair things! LOVE! Breck wears them daily!! Especially her headbands!